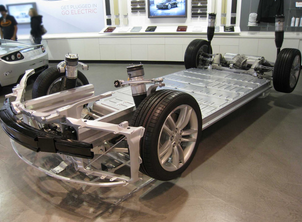 Any electric vehicle is really a combination of two separate systems. Without a battery the car is ‘kaput’. This is very much the same for a datacentre UPS system. In an uninterruptible power supply we have a similar configuration with electronics (an rectifier, inverter, EMI filters and static switch) and a connected fuel source. In the Tesla the batteries as the photo shows are within the frame. In a UPS system the batteries may be within the UPS cabinet or within a separate battery cabinet or on a cladded open or closed stand. For UPS systems the fuel source is a Valve Regulated Lead Acid (VRLA) battery. The battery may have a five-year or 10 year design life. Other, greener energy storage sources are available but these tend to require a higher capital investment. Alternative fuel or DC power sources include lithium-ion batteries (as used in electric vehicles like the Tesla), DC flywheels, hydrogen powered fuel cells and compressed air driven DC generators. The first difference between an electric vehicle and a datacentre UPS system is that the uninterruptible power supply will only draw on its battery when the mains power supply fails or becomes unstable. Rather than continuous use, we have sporadic use as an emergency DC fuel supply to power the UPS inverter. The second difference is in the battery management system. Any device that uses a Lithium-ion battery has to have a more complex and sophisticated battery charging and management system. Within such a system, there are far more sensors and safety features to monitor for and prevent thermal runaway. Whilst most uninterruptible power supply manufacturers will use all sorts of marketing jargon to say otherwise, their battery management system is less sophisticated. Yet, over 90% of datacentre UPS system crashes are due to battery problems and essential the battery voltage collapsing when sudden load is placed on it. In the UPS industry the correct description for a UPS battery is ‘UPS battery set’. This is because the set is made up from individual battery blocks. If you have a petrol or diesel car, the starter battery is actually a battery block. To function with a UPS we size the battery set to have a certain Ampere-hour (Ah) rating and DC voltage. The DC voltage has to be within the DC voltage input window of the inverter, for the UPS inverter to be able to generate an AC voltage waveform to power the load. The Ah-rating defines the runtime available at a specific load in terms of power (Watts/cell). Suppose we have a DC voltage (typically 12Vdc) and Ampere-hour rating (e.g. 100Ah). The UPS battery set may have one battery string (40×12Vdc=480Vdc, 100Ah) or several strings connected in parallel (2×100Ah=200Ah). All batteries age with use. There actual life span is dictated by a number of factors including ambient temperature (20-25degrees Centigrade is recommended) and typically 200-300 charge/discharge cycles. As batteries age, impedance increases. This is a resistance to the flow of electrons between the battery plates and leads to a heat build-up. Eventually the resistance is so high that the battery cannot hold sufficient charge. Batteries will also age at slightly different rates, as they are chemical reaction systems. Most UPS systems will automatically test their batteries every 24 hours and issue an alarm code if a capacity or DC voltage parameters falls below a pre-set level. The issue for datacentre managers is that this testing is for the overall connected battery set. The firmware and electronics with a UPS system are generally incapable of detecting a weakening battery block within the overall battery set. When there is a build up of failing batteries, the only indication for the datacentre manager may be a UPS alarm or the failure of the UPS system to support the load during a power cut. One thing that datacentre managers often report is that the runtime available from their UPS systems when mains power is present tends to reduce quickly during the first few minutes of a power cut and then stabilize. This is due to the UPS firmware estimating the runtime and battery charge % and the sudden impact of drawing power from the VRLA battery set. With a Lithium-ion battery, the more sophisticated battery charging and monitoring system is more accurate; as it needs to be if EV-drivers are to be able to accurately rely on their fuel gauge (battery charge %). What can also happen with a UPS battery is a sudden collapse of the DC voltage. This is typical of a battery set that is beyond its working life. In this scenario a UPS system crash is inevitable if the mains power supply has not been restored or a standby power generator started. The static switch, which gives a UPS system its inherent reliability, has no secondary supply to transfer the critical to as the output voltage from the UPS inverter collapses. So what can datacentre managers due to prevent this worst-case scenario? There are two solutions. The first is to install a separate battery monitoring system for the battery set. Such systems may only be viable economically for very large uninterruptible power supply installations (greater than 500kVA). The system relies on individual battery sensors being connected to each battery block and connected (wired not typically wireless) to a battery monitoring station or CPU. Each battery block has a unique ID (battery number and string number) and data recorded locally or on the Cloud for trend analysis. As the monitoring is continuous alarm conditions are reported immediately. A more cost-effective method is to add battery testing to a preventative maintenance visit. This is also a simpler solution and relies on the UPS engineer being trained in DC voltage work. Again each battery has a unique ID and the UPS engineer uses a hand-held conductance battery tester to test each battery block. Typically 40 batteries can be tested within 60 minutes and so the additional time overhead on site is not excessive. The data is again stored in the device but can be retrieved via a memory stick or USB connection for analysis. As with a fixed battery monitoring system, the data can be placed on the Cloud and stored for trend analysis. If the batteries are tested when first installed a true baseline can be established for the healthy set. It is also possible to first-test batteries when they are several years into their working life. For this the UPS engineer may use a Siemens value (conductance measurement) available from the battery manufacturer. Apart from giving the datacentre manager confidence in the UPS battery set and each individual battery block, conductance testing can also help to lengthen battery life and reduce battery replacements. In the early days of operation, testing can help to identify a battery block failing earlier than normal. Replacement is generally possible at this stage as overall impedance levels are low. Additionally, as the battery ages, the testing can help a datacentre manager decide whether to run another 12 months with the existing battery set rather than replacing based on recommendations. The typical recommendation is to replace a five-year design life battery within 3-5 years and a 10year within years 7-8. Conductance UPS battery testing may well lengthen these to 4-6 and 8-10 if the UPS does indeed feature ‘advanced battery management’ and the overall ambient environment has been kept within the 20-25degrees Centigrade, as recommended by all VRLA battery manufacturers. Just like a Tesla, Nissan Leaf or any other electric vehicle, uninterruptible power supplies are only as good as the energy stored within their batteries. As a UPS battery set ages within a critical power application, the system may well need additional battery testing, either as a fixed system or as part of an annual preventative maintenance visit. Only then can a datacentre manager have 100% confidence in the ability of their UPS system to support their load and for the backup period they are expecting.